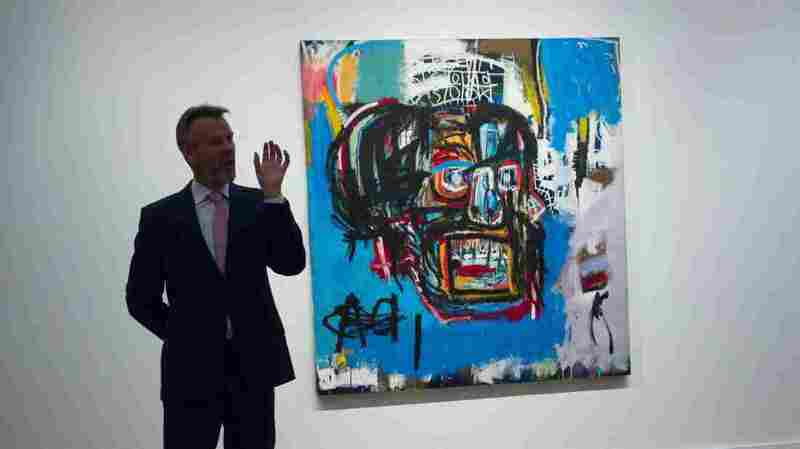 At $110.5 Million, Jean-Michel Basquiat's Painting Becomes Priciest U.S. 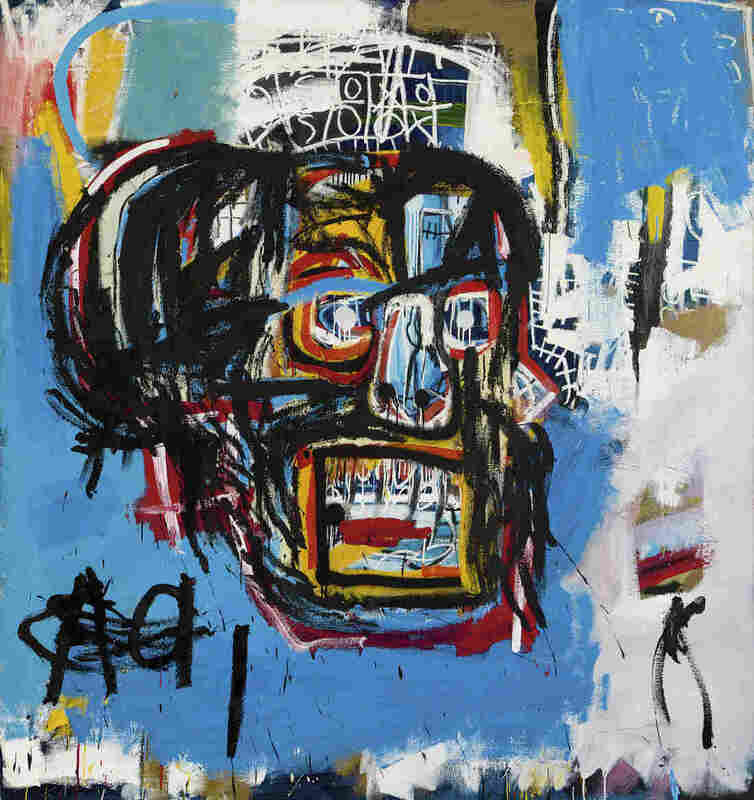 Artwork Ever Sold : The Two-Way With the sale Thursday night in New York City, the late Jean-Michel Basquiat's 1982 untitled painting is also said to be the sixth-most expensive work sold in world history. Jean-Michel Basquiat's untitled painting of a skull is displayed behind an official with Sotheby's, which offered the media a preview earlier this month. On Thursday, the work sold for $110.5 million — the highest sum ever paid at auction for a work by a U.S. artist. Jean-Michel Basquiat joined "joined the pantheon of great, great artists" Thursday night, when the late painter's 1982 work Untitled sold for a record-breaking $110.5 million at auction — the highest sum ever paid at auction for a U.S.-produced artwork. That breathless assessment was offered after the sale by Oliver Barker, chairman of Sotheby's Europe. So you can imagine just how thrilled the buyer must have been. "I am happy to announce that I just won this masterpiece," Japanese billionaire Yusaku Maezawa said in an Instagram post revealing his identity as the buyer. "When I first encountered this painting, I was struck with so much excitement and gratitude for my love of art. I want to share that experience with as many people as possible." The purchase price elicited gasps in the room as it sailed past expectations during the 10-minute bidding war at the Sotheby's auction, according to ARTNews magazine. In fact, the publication notes, the painting nearly doubled the previous sales record for a Basquiat work, which was set last year — also with Maezawa as buyer. The 41-year-old tech tycoon, rock musician, fashion entrepreneur — and, well, we can let CNN take it from here — says he intends to place both Basquiat paintings for a museum he's planning in his hometown, Chiba. "But before then, I wish to loan this piece — which has been unseen by the public for more than 30 years — to institutions and exhibitions around the world," he said in a statement quoted by The New York Times. "I hope it brings as much joy to others as it does to me and that this masterpiece by the 21-year-old Basquiat inspires our future generations." Basquiat died several years after creating the work that sold Thursday, overdosing on heroin in 1988 at age 27. The New York native, son of a Puerto Rican mother and Haitian-American father, began in street art and assumed mythic stature after his death — influencing a generation of artists with his visceral, politically inclined works. With Thursday's sale, ARTNews reports that Untitled broke the American record held by Basquiat's friend Andy Warhol and became the sixth-most expensive work ever auctioned in the world.